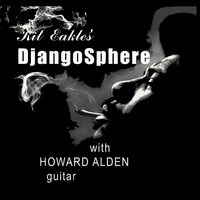 DjangoSphere is jazz violinist, Kit Eakle's project inspired by the compositions of Thelonious Sphere Monk and Django Reinhardt and this recording features guitar great Howard Alden. As noted jazz reviewer Andrew Gilbert put it in the San Jose Times, “What would have happened if legendary gypsy jazz guitarist Django Reinhardt wandered into Minton’s Playhouse . . . in 1946 and jammed with pianist/composer Thelonious Monk at the Harlem nightspot that served as the essential forum for the birth of modern jazz? Because Reinhardt’s music inspired a new style of jazz which we now call “gypsy jazz,” few non-string players understand his contribution to the development of bebop and modern jazz. By breaking away from the guitar-based rhythm section with no drums, Django’s later music helped to expand the vocabulary of modern jazz. In juxtaposing Monk’s music with Reinhardt’s, DjangoSphere shows their like-minded use of parallel and chromatic harmonies, their highly individual and original approaches to their instrument and their experimental and idiosyncratic use of unusual forms. Bringing their unique styles together expands the stylistic possibilities of their compositions; opens their vocabularies to new interpretations and possibilities for the voices of gypsy jazz violinists and guitarists, who are not familiar with Thelonious Sphere Monk. and gives to pianists and horn players a whole new jazz repertoire by Django to explore. In this CD Eakle brings Django and Monk together, while expanding the use of the violin in jazz, all under the amazing wizardry of Howard Alden to expose the bebop and modern jazz elements in Django's compositions. 1. Monk's 'Hackensack', introduced with with the old standard from Django's repertoire, 'Lady Be Good,' on whose chords Monk based Hackensack. 2. Eakle's own composition 'Tsawwassen Drag' uses Django-like musical rhythmic ideas ('Viper's Drag,' 'Blue Drag') to illuminate the West Coast Canadian experience of waiting for the Ferry to Victoria B.C. at the Vancouver arrival port in Tsawwassen. 3. 'Four In One' is a complex tune whose mysteries have been exposed by Eakle's personal discovery that this tune is based on the old hackneyed standard 'Five Ft. Two.' Notice that the title can be used - diminishing each element of the Title by ONE - from 5 ft 2 to 4 in 1! 5. 'Artillerie Lourde' (Heavy Artillery in English) is a Django Reinhardt composition based on Tuxedo Junction, but with many 'explosive' Monk-like elements. 6. 'Flèche d'or' is another unusual Django composition named after the train line that connected London and Paris, delivering passengers to the port crossings on each side of the English Channel, a route Django would have traveled to get back to France after the outbreak of World War II caught him in London. 7. 'Bayview Stomp' is a Monk-like communal composition by the original members of the Hot Club of Marin, Eakle, and guitarists Dore Coller and Ned Ripple. 8. 'Just Squeeze Me' - an elegant Ellington composition often associated with sometime Ellington violinist, Ray Nance. 9. 'Little Rootie Tootie' is a Monk composition, written for his daughter 'Boo Boo' inspired by the children's book 'Little Toot,' and therefore related to the Django composition above 'Flèche d'or,' depicting mid-20th century mechinanical travel technology.